Native Grounds is going to be on an episode of the PBS show “This American Land”. Comments Off on Native Grounds is going to be on an episode of the PBS show “This American Land”. Here is an article about the upcoming show in “The Albany Democrat-Herald”. Comments Off on Follow us on Facebook! 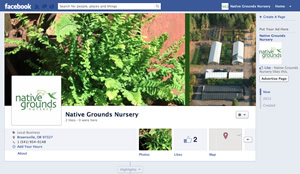 We are pleased to announce Native Grounds is now on Facebook which makes it easier for you to keep up with what’s going on here. We have new and exciting things happening here and so we will be posting this news to our website and Facebook page. Also, please take a moment and bookmark our online availability list here.